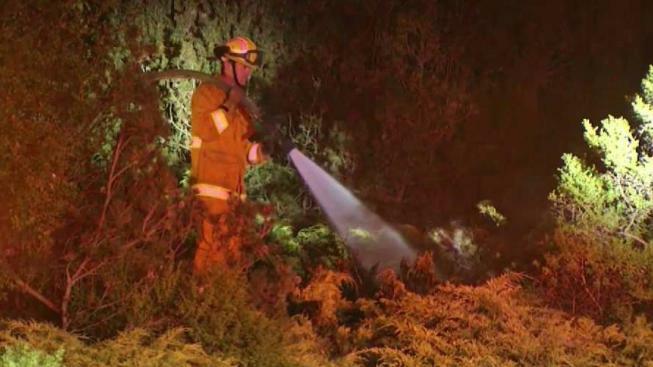 Firefighters managed to put out a small fire before it could seriously damage a San Jose home. The fire happened a little after 1 a.m. Monday on Mount Hamilton Road. Firefighters arrived to find the fire burning in a planter outside the home. The damage was limited to surrounding landscaping. The blaze is believed to have started from fireworks. Firefighters on Monday were able to douse a small fire outside a San Jose home before it could seriously damage the residence, according to Cal Fire. The blaze was reported just after 1 a.m. along Mt. Hamilton Road, Cal Fire said. The first crews on scene found the fire burning in a planter stashed in a landscaping area in front of the home. Fireworks may be the reason to blame for the fire, according to officials. San Jose Fire Department crews were able to knock down the blaze in roughly 10 to 15 minutes.